You’ll know from a previous blog post that having websites linking out of your Blog or website is a great way to drive traffic. If you are a WordPress user you’ll probably already know how to embed a URL to a work within your text. But what about embedding URLs to images and having multiple URLs? 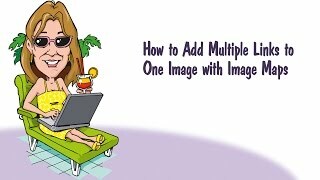 In this how-to you’ll learn how to use a tool called image maps to embed multiple images to your website within images in just a few easy steps. Using a basic copy and paste HTML Code format which is very straightforward. You’ll also see that there are a couple of custom options if you to add a URL to an image which isn’t rectangular or square. Awesome. It’s exactly what I was looking for! Thanks a lot. Thank you so much! I was just wondering, is this mobile responsive? Thank you!!! Wow!!!! That was great information. I didn’t know that. I needed JUST that kind of tool for the assignment I am currently doing. You are GREAT!!!!!!! Thank you. That’s Awesome!! Thank you for posting. How do I remove source code from the html after the links are created? the image became a bit glitchy after adding links. I assume this would work in a Mail Chimp email too? Thanks for the info. Really helped me out with an assignment. Can you make the links no follow? Hello, have you ever done this for a Gmail Signature. I want to show three social media links in my signature image. However it appears gmail is not recognising the links. Scratching my head re. inserting a multiple link image onto a WordPress page (know how to do hotspots in DW) then found this vid via simple Google search. Really useful – thanks!